Online stores often have some real world physical brick and mortar stores where they sell the same products as well. Lots of Magento merchants use different store locator extensions to handle the necessary functionality. We have some thoughts on store locators and dealer locators from the technical perspective written down on our blog. There are a few things that you need to take into consideration when you’re creating a store locator for your Magento store if you want it to rank well on Google local search. Google recently released the guidelines that describe the optimal way of displaying your store’s physical locations on the web. Great thing is, Google actually has some microdata markup examples published here to make it easier for you to implement it properly. With new microdata markup you can even set the special working hours for holidays and similar advanced stuff that will be understood by Google and shown to users directly in SERPs. First of all, there is a difference between a Google plus business (brand) page, for example +Inchoo, and a Google+ local page, for example Inchoo’s local page. Both of them are Google+ pages, but with different layouts and functions. While your brand page is used more like your brand’s Twitter account, a local page should be used by your users to leave reviews of the single branch they’re visiting instead of the brand as a whole. For this reason, each of your physical stores needs its own Google+ local page, while only one Google+ business page is necessary for your brand. For creation and verification of your Google+ local pages, refer to this guide. Note that you’ll have to have physical access to the location’s mailbox or business phone to be able to verify the location. “I don’t need a Google+ account, it’s a ghost town” says an online store owner. Well, it’s a ghost town with over half a billion monthly active users. That’s a pretty densely populated ghost town if you ask me. “Yea, but it’s only used by photographers, marketers and similar folks, they’re not gonna buy from me” replies a store owner. Maybe, but who knows what the conversion rate of visitors from G+ on your store will be until you try using it. One day G+ might even gain popularity within your target audience, it would be great if you have reserved your vanity URL instead of it being held by your competitors. Even if no one from Google plus will buy from your store and there’s no chance that your buyer persona will ever be active on Google plus, there are some hidden benefits of using Google plus as an eCommerce brand. What’s that thing on the right and why would Google show (in some cases) my competitors down there under “People also search for”. A user is searching for my brand name, don’t show my competitors to the user! Google why?! Well, the thing on the right is Google’s knowledge graph. Google takes data from wikipedia, freebase and similar resources to compile some “facts” about your brand. Unfortunately it will also display that nasty “people also search for” column in the bottom of the box. If it shows up for your brand name, there’s not much you can do about it. You can’t really get it removed. You can influence the content of it by editing any wrong facts that might be there at the sources (wikipedia, freebase) and that’s pretty much it. Now this is a bit better. And it’s all thanks to Google plus. 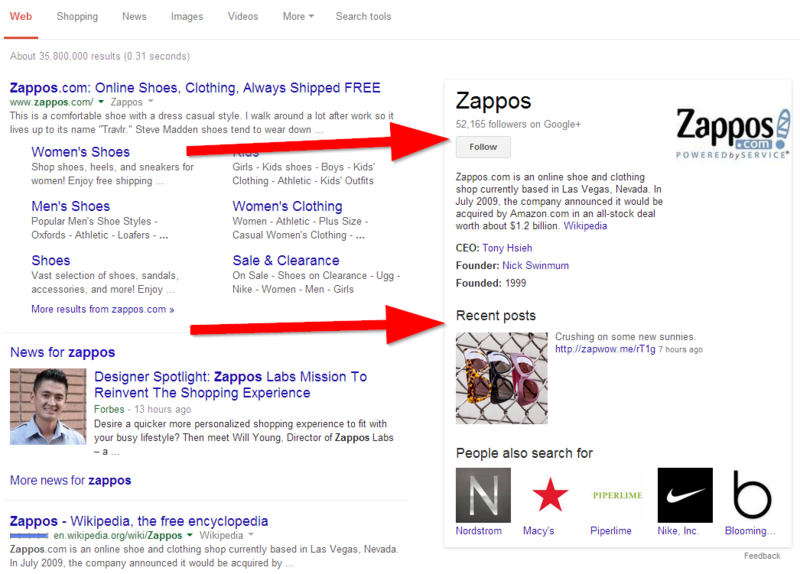 Link your Google plus brand page and your website and you get new features in that box on the right. The follow button so that people can follow your brand directly from the search result pages and – my personal favorite – the recent posts section which will display your latest share from your Google plus account. Not only that this will help you gain more followers or promote some important stuff directly from the SERPs, it will also push the “people also search for” box further down towards the fold. 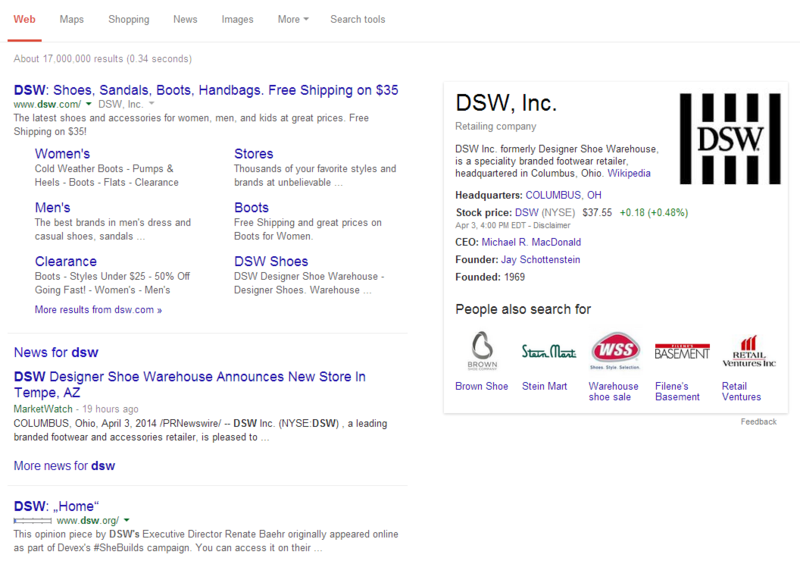 Another hidden benefit of using Google plus as an eCommerce brand is the speed of indexing. When you share a URL through Google plus it will usually get indexed within 6 seconds. That’s a really good way to get new products or blog posts indexed fast, before scrapers get their hands on it and duplicate it. HI Inchoo. I am Magento developer. i have seen that blog comment post are submit without any data….Put some require field here.